Nothing is quite as flattering as a skater dress: the flared circle skirt creates a gorgeous silhouette that suits all body shapes, so no matter whether you’re curvy, tall, petite or somewhere in-between the skater dress will make you look (and feel) amazing. Our favourite thing about skater dresses is that there’s a style for absolutely any occasion. Similar to the little black dress, make sure you stock up on a variety of skater dresses if you haven’t already. For day-to-day wear, choose a skater dress with a cute floral print. You can then mix it up by pairing it with bold accessories or a pair of chunky block heels for a look that’s suitable for the office or for a weekend lunch with the girls. Skater dresses are also a perfect choice for an on-trend party outfit, with a variety of gorgeous different styles to choose from. We love the Taliyah Choker Neck Dress for a look that’s sure to turn heads - this dress has a choker neckline and is an off-shoulder style, hitting two hot trends at once. Pair this with some killer faux suede knee high boots and get ready to slay! If you have a more demure personal style, pick a long-sleeved skater dress that will create a classy and modest look. Our best-selling Caitlin Off Shoulder Skater Dress is made from a super soft jersey fabric with long sleeves and a knee-length hemline. 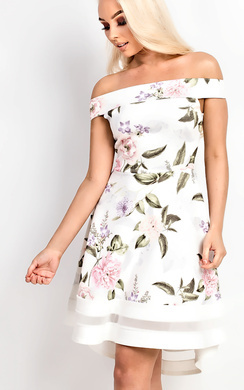 This dress is ideal for a wedding or christening guest outfit- all you need to do is team it with some killer stiletto heels and you’re ready to go. If you’re not sure which skater dress is the right style for you, choose a plain jersey design that you can wear with either heels or ankle boots depending on the occasion. This style is so versatile you’ll be sure to wear it again and again, making it a firm wardrobe favourite in no time!